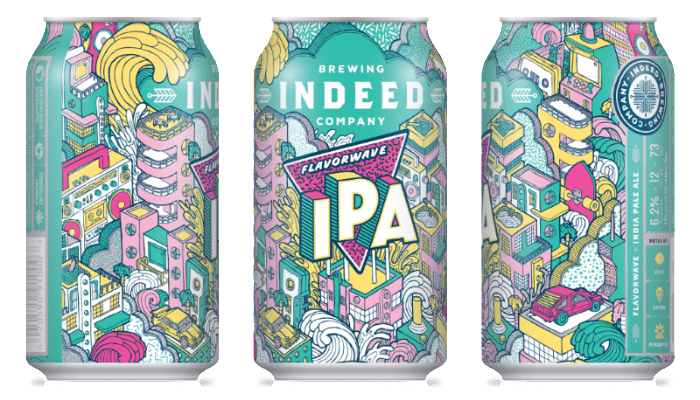 MINNEAPOLIS, MN, SEPTEMBER 4TH, 2018: Indeed Brewing Company announces the release of Flavorwave IPA. Flavorwave is the latest creation from Indeed Brewing Company’s Head Brewer, Josh Bischoff, who explains, “For the recipe of our first year round IPA, we felt it was appropriate to explore current trends in hopping techniques both in the brew kettle as well as dry hopping. We chose a handful of our favorite classic and new American hops all leaning towards a juicy and fruity profile. The end results in layers (or waves) of hop flavor and aroma while leaving the ‘old school’ signature IPA bitterness largely behind.” Brewed with Denali, Citra, Mosaic, Centennial, and El Dorado hop varietals, Flavorwave pours a bright golden hue with a subtle haze, a light body, and a crisp finish. There will be several draft release parties including Turtle’s Bar & Grill on September 12th from 5-10 pm, Brunson’s Pub on September 12th from 3-7 pm, and Red Cow on 50th and France on September 13th from 4-10 pm.